There are presentation boxes meant to protect valuable books ... and then there’s the boxes custom-made for LABYRINTH SUBLIME and ANTARCTICA. 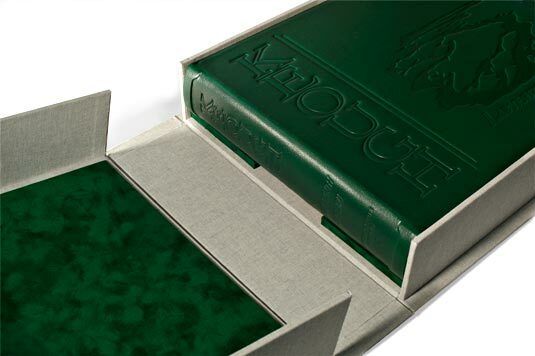 Our elegant, presentation boxes are hand-crafted: initially by Felton Bookbinding (who made all of the ANTARCTICA boxes) and now by Friesens. These clam-shell style boxes are sturdy and each weighs 8.6 pounds (4 kg) when empty! Making one is no simple feat. 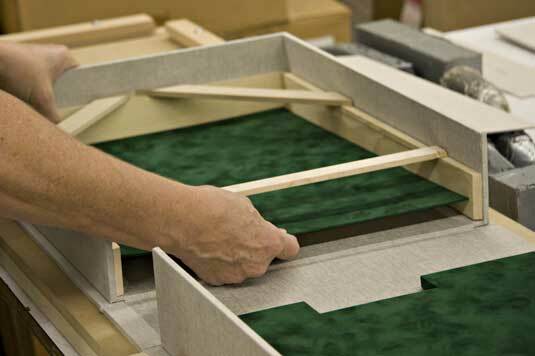 Not only is the construction intricate, but also 100% accuracy is essential so as to create a good fit for the tomes and to ensure the boxes smoothly open, close and hinge. Rigidity is built into the structure so that the interior walls are solid with no tendency to splay. You would be surprised at the many details that seem at first blush to be insignificant, yet have a huge impact upon the aesthetics and functioning of the finished box. 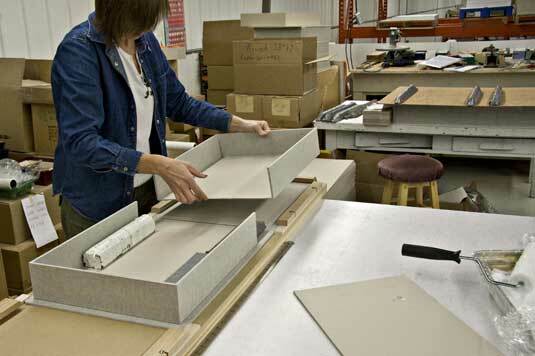 At the core is an archival, dense, 1/4" thick binder’s board. In these two photos the women at Friesens are working together on the top tray. Top and bottom trays are required for each box. 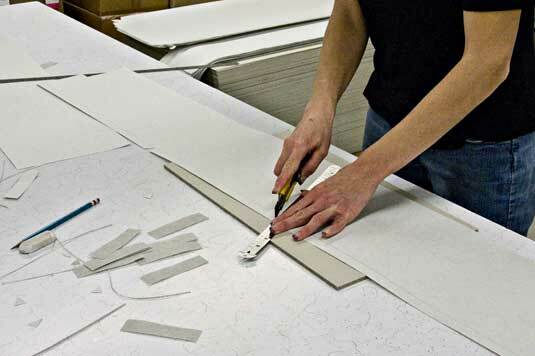 An archival glue is used to bond three stand-up walls to each base. Once the two trays are formed, and while the glue is yet malleable, the trays are fitted one atop the other to ensure exact alignment. When solid, the corners are strapped with a reinforcement of finely woven linen fabric. Then the outer cladding of Dutch natural linen is measured, cut and notched. This long and narrow piece, shown in the photos immediately above and below, is actually for the box cover. Working together, glue is applied to the linen. The cloth now wetted, becomes pliable. 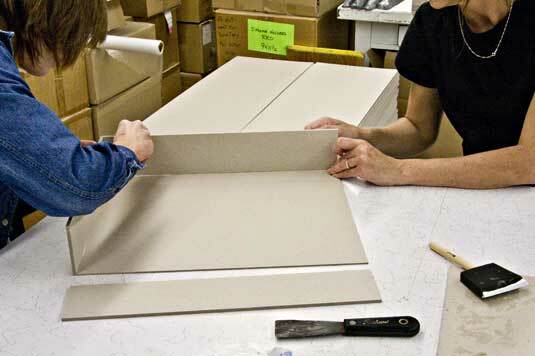 Care is taken to minimize glue getting on fingers and to avoid marring the front side of the linen. 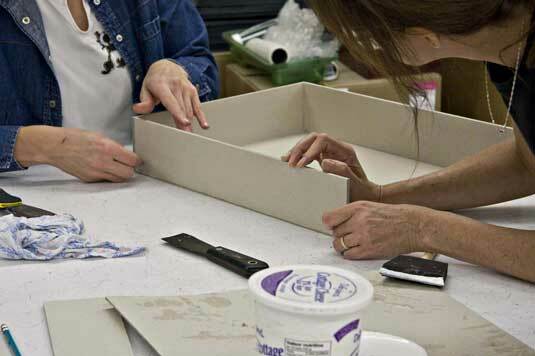 The ladies wrap the Dutch linen about one of the trays, snipping and fitting. They coordinate their efforts conscious of time concerns regarding the set of the glue. 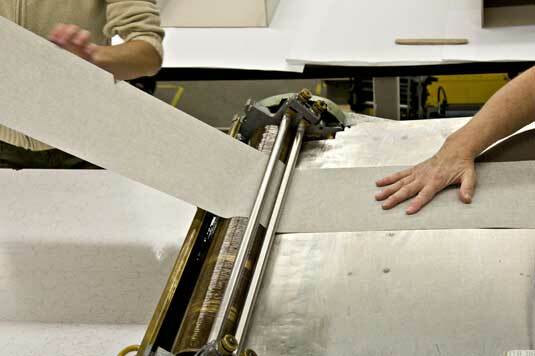 A traditional bookbinder’s tool called a bone folder is used to ease the fabric into the right-angle corners of the tray. The two matching trays are wrapped in similar fashion. Each has three side walls. The cover is made from three separate panels: the front board, the spine board and the back board. These three are joined together as one unit with the Dutch linen. The tolerance of the hinge — on either side of the spine — is unforgiving. Too tight and the box will not close properly. 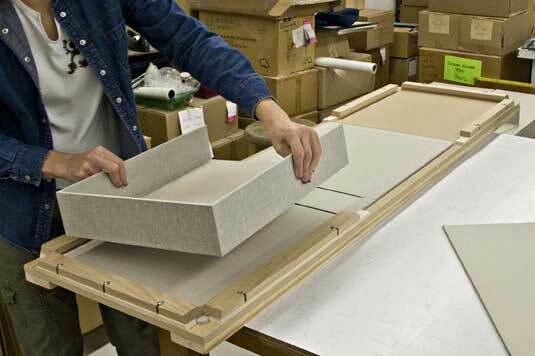 Too loose and the front, back or both panels will override the spine when the box is closed. Very close attention is necessary throughout the manufacture. 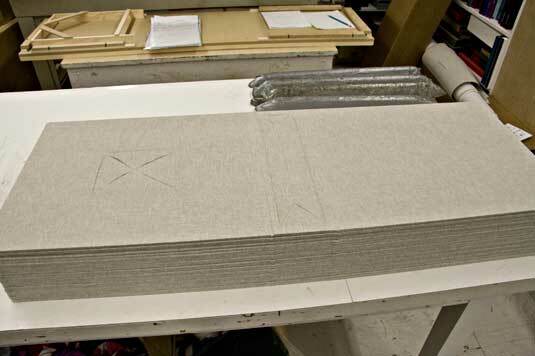 You may notice the large X cut into the front panel and the spine of the linen-clad cover atop the pile above. 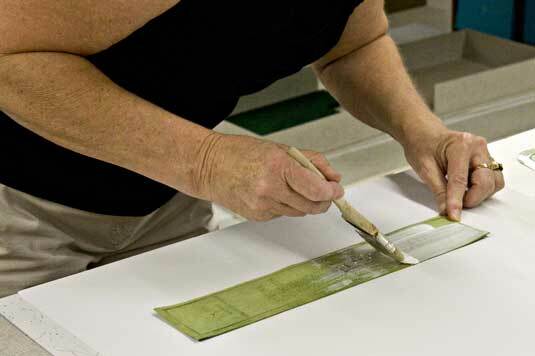 The linen is cut to the corners of a recess formed in the boards where an inlay of our morocco is to be inserted. This rich and beautiful goat leather has been embossed with the title and our labyrinth design. Both the suede side of the leather and the recess itself are brushed with glue. Placement of the leather inserts is critical, as being out of square or alignment by even 1/32" is visible to the eye. Since these photos were taken, a jig has been made to ensure consistent accuracy. The bone folder is used to push down the leather at the edges, easing the glue to the last fiber of leather to ensure a strong contact. At this stage with the cover prepared and separately the two trays as well, it is time to bring these modules together. 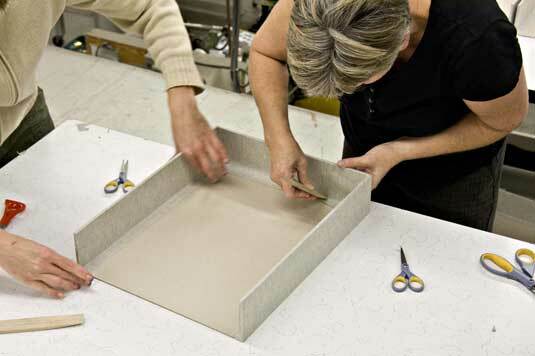 With the cover laying flat in this elaborate jig, the first tray is positioned overtop, allowing for the cover to protrude beyond the tray with a consistent lip. 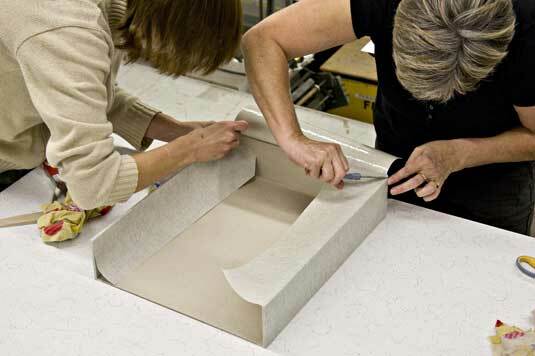 The tray is adhered with the archival glue and is heavily weighted while the glue sets. Sliding the cover along to the far end of the jig, the second tray is positioned and glued. More weights are placed in the trays. The box is left overnight allowing the glue to solidly dry under pressure. Finishing touches include preparing and installing the flocked-velvet cushions. The thicker cushion lines the bottom tray upon which the book will lay. Pat and Rosemarie designed this cushion with full recesses at the mid-point, the purpose being to facilitate removing the weighty book from its presentation box, allowing fingers to get under the book whence it can be lifted. 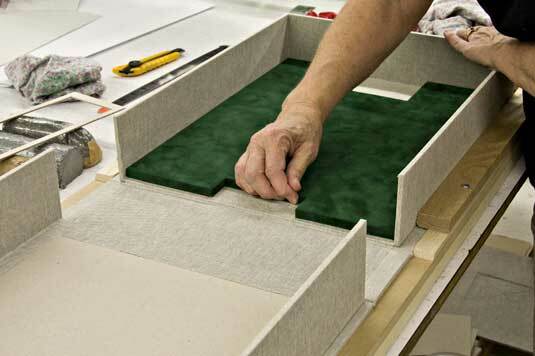 Friesens has developed yet another jig for the positioning of the green velvet cushion that lines the upper tray. With these two cushions in place, there is but one further step — providing support for the book pages. 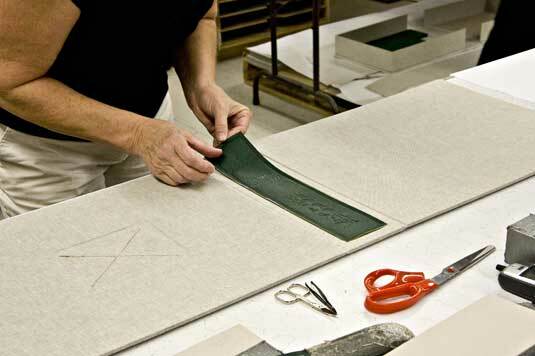 To this end, a velvet-covered shim is positioned and fixed to the bottom wall of the inner tray, on which the pages will seat. Here it is! LAYBRINTH SUBLIME within it’s presentation box! 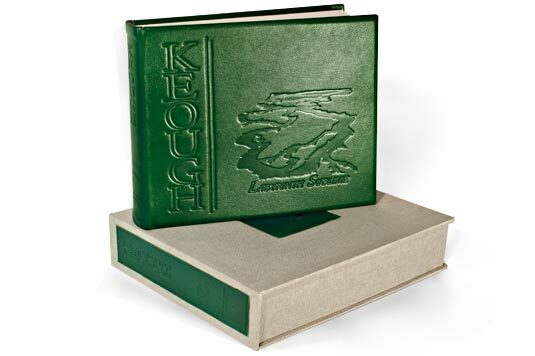 Together, tome and presentation box, make quite the physical statement!